The Ring Celestial Bliss was designed for one of the last in a series of spring festivals celebrating the Chinese New Year. Part of this year’s Taiwan Lantern Festival, the steel and bamboo structure looks like a giant glowing object hovering over the ground. 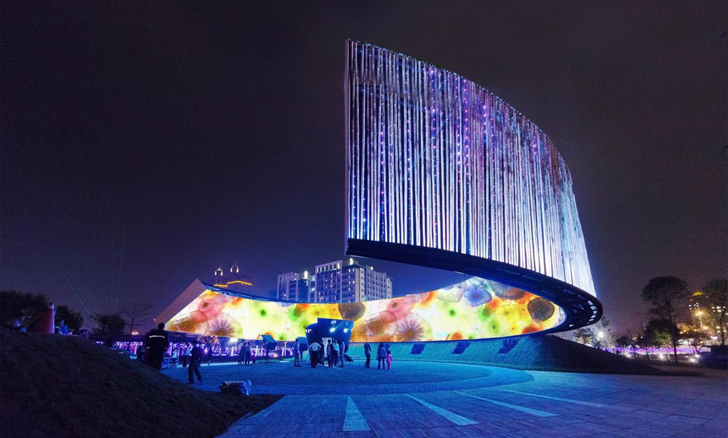 The architects at J.J. Pan & Partners conceived it as a metaphor for nature’s endless cycle of life, surrounding the visitor with a continuous ring of beautiful effects achieved through the use of LED lighting and projection technology. 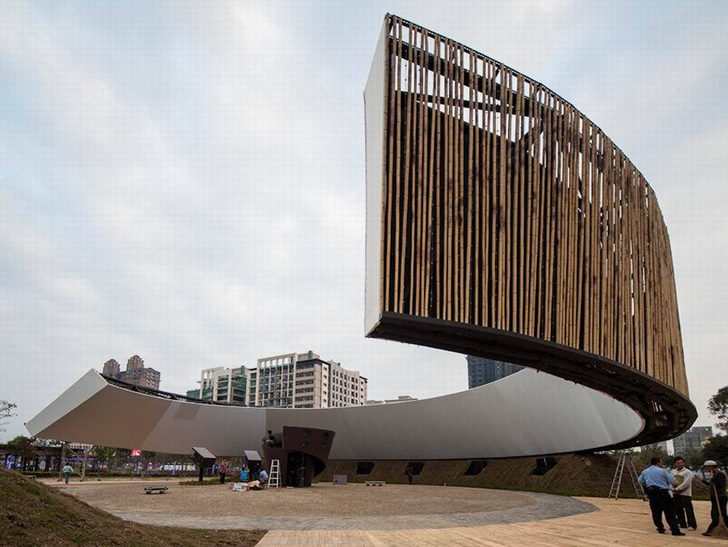 The structure is made from reusable steel, which serves as the primary structural system, and bamboo cladding. The inner projection screen was made from recycled materials, while bamboo sections were incorporated into the flooring. Construction materials were locally sourced, significantly reducing transportation carbon footprint. The steel structure was specially designed to make the entire object appear as a glowing object suspended in the air which floods visitors with images and lighting effects. It is meant to inspire prayers for the future and create a surreal experience that represents the endless cycle of life. The structure features a shifting inclination to create more dynamic viewing point and augment the experience. Es grandioso lo que hicieron, me gustaría participar en algo así de creativo...invítenme por favor, creo que puedo aportar cosas interesantes en esta área de la arquitectura escultórica y panorámica del presente, siempre y cuando sea con los mas altos valores humanos y para la gloria de Dios y toda su creación. The structure is a combination of reusable steel as the primary structural system and bamboo cladding. The inner projection screen was made from recycled materials. Bamboo sections were incorporated into the flooring. Construction materials were locally sourced which significantly reduced transportation carbon footprint. The steel structure was specially designed to make the entire object appear as a glowing object suspended in the air. The structure floods visitors with images and lighting effects. It is meant to inspire prayers for the future and create a surreal experience that represents the endless cycle of life. The structure features a shifting inclination to create more dynamic viewing point and augment the experience. The triangular plan of the the Ring of Celestial Bliss incorporates the logo of the sponsor – Delta Electronics. Inspired by Taiwan’s culture and using local technology and materials, the design celebrates the spring Lantern Festival and conveys the message of the old Chinese saying –“Blessings as high as the sky”.